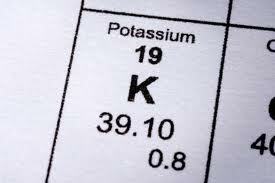 Potassium (K) is an essential element for plant growth it is important to food crops. Potassium, often called potash, helps plants use water and resist drought and enhances fruits and vegetables. If soluble Potassium is deficient in soil it can stunt growth and cause other symptomatic issues. To overcome deficiencies Potassium is commonly applied to gardens, lawns and orchards as part of a balanced fertilizer. In addition, Potassium promotes healthy green lawn grass. Potassium grows healthy lawns by promoting green sturdy stems on deep roots. It aids roses and other flowering plants by encouraging strong stems and well-developed flowers. Farmers depend on potassium for healthy crop production. Plants rich in carbohydrates such as potatoes need potassium for tuber growth. Potassium regulates plant growth so that harvested fruit is fully formed, high quality and has a better shelf life for consumers. Because large amounts of (P) are absorbed from the root in the production of most agronomic crops, it is classified as a macronutrient. Most soils can supply some K for crops, garden and lawns, but when the supply from the soil is not adequate, K must be supplied in a fertilizer program. Having your soil tested will help to identify exactly which fertilizers you should use for best results. Also, it is one of the three nutrients found in synthetic fertilizers: NPK = nitrogen, phosphorus, potassium. Typical symptoms of potassium deficiency in plants include brown scorching and curling of leaf tips as well as chlorosis (yellowing) between leaf veins. Purple spots may also appear on the leaf undersides. Plant growth, root development, and seed and fruit development are usually reduced in potassium-deficient plants. Often, potassium deficiency symptoms first appear on older (lower) leaves because potassium is a mobile nutrient, meaning that a plant can allocate potassium to younger leaves when it is K deficient. Potassium deficient plants may be more prone to frost damage and disease, and their symptoms can often be confused with wind scorch or drought. Compost: Compost is full of nutrients, including potassium, especially if it is beefed up with banana peels and other fruit and vegetable waste. The potassium compounds in compost are water-soluble, which makes them readily available to plants but also likely to leach out of your compost pile over time. Wood Ash: The original source of “potash” fertilizers, hardwood ashes can be used directly as a fertilizer (about a 5-gallon bucket per 1000 square feet) or added to your compost pile to increase the potassium content. Wood ash also raises soil pH, so be sure to do regular soil testing to make sure it stays balanced. Kelp Meal: Available dried or liquid, kelp and seaweed offer potassium to the soil in a fairly quick-release form. Greensand: Mined from ancient former sea beds and is rich in a number of minerals including potassium. It’s used both as a fertilizer and a soil conditioner, or it can be mixed with compost. Muriate of Potash (potassium chloride): Mined from ancient deposits, this commercially available product can be used as natural sources of potassium, though the chlorine found in it can harm soil microbes. Sulfate of Potash (potassium sulfate): More expensive than muriate of potash but safer, since it doesn’t contain chlorine. Not all potash products are considered organic, so make sure the product you use is approved by the Organic Materials Review Institute (OMRI). Sul-Po-Mag: A variation of potash, Sul-Po-Mag is actually a naturally-occurring mineral called langbeinite (sulfate of potash-magnesia). Sul-Po-Mag is water soluble and convenient, although it shouldn’t be used unless your soil also needs sulfur and/or magnesium. Granite Dust: Available from granite quarries, granite dust is a relatively inexpensive way to add potassium and tract minerals to your soil. Since it’s ground-up rock, this product is very slow to release its minerals and is not a quick fix or drought. The deficiency is most common in several important fruit and vegetable crops. For healthy crops and plants (or lawns) first have an accurate soil sample test performed to determine what fertilizer you may need. When looking for a fertilizer rich in nitrogen, check the middle number labeled on the fertilizer bag. Usually the bags are labeled with numbers such as 13-35-24 or some other combination. The first number is Nitrogen, the second is Phosphorus and the third is Potassium. 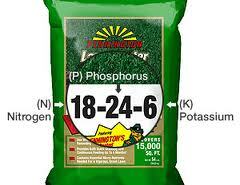 Fertilizers high in Phosphorus are usually determined by a high middle number. A simple soil test will help determine exactly what is needed to give you the highest yielding crops, most delicious fruits and greenest lawn. If you are not sure about the essential elemental balance in your soil contact us today to find out how we can help. We offer a soil test for potassium and other essential elements which is much more accurate than store bought tests. Come see why some of the largest crop producers in the state have come to count on Phoslab Environmental Service since 1965.